The B.S. in Corporate Fitness offers a wide and diverse range of job opportunities within fitness, exercise, health, wellness, nutrition and rehabilitation. Every corporate fitness major is required to apply his or her classroom knowledge to a real world setting by completing a practicum (internship). Employers or students may initiate the practicum. Often practicum experiences lead to offers of employment. Check out a snapshot of Corporate Fitness and Wellness Management! Is corporate fitness and wellness management right for you? Successful exercise/fitness trainers are good listeners, able to keep clients mo¬tivated, are physically fit, have excellent speaking skills, and can evaluate clients’ needs and skill levels and create appropriate fitness plans for them. Completed in 2012, the Minot State University Wellness Center features a rock climbing wall, cardio exercise equipment, weight rooms and exercise studios where classes are offered in everything from yoga to kickboxing. Corporate fitness/exercise trainers lead, instruct, and motivate individuals or groups in exercise activities, including cardiovascular exercise, strength training, and stretching in a corporate or business setting. Our well-qualified instructors are sought after for their scholarly expertise and their contributions to the community. We provide the academic training and field experience you’ll need for a career in corporate fitness. 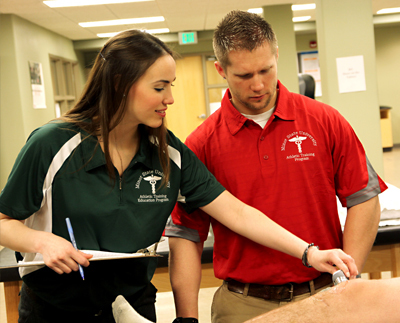 Minot State University’s College of Education and Health Sciences is internationally known for preparing quality professionals and pre-professionals in health science, human service and education. Our facilities are equipped with state-of-the-art technology. Please contact us for more information. Better yet, plan a campus visit so we can arrange a tour and meet face-to-face.